No Great Things : There is a goat. On the bus. Greetings from a lazy Sunday in Haiti. For the first time since I have been here, the day is overcast, cool, and drizzly... I didn't think we could get weather like that here! Reveling in it but it is not helping my cravings for my fall time favorites of pumpkin spice coffee and fresh apples! This weekend was quite an adventure! Friday morning, we left at 9:00 Haitian Standard Time (read 10:15) to head up to Cap Haitian to pick up the nursing students. The Dean thought that it would be a good chance for us to get to see some of the country, which it certainly was! Here is a map to give you an idea. 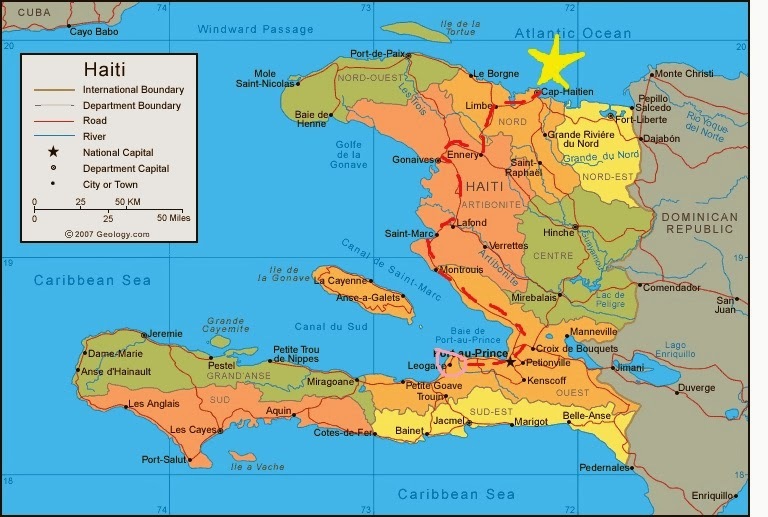 Bear in mind that Haiti is the size of Maryland. The trip took 10 hours. Banana soda. Really just sugar in the bottle but it was fantastic! This is A PAVED ROAD. A beautiful paved road with no potholes, no speed bumps to veer around, lines, no puddles, a consistent speed, AND it was along the ocean. It was stunning. The major highways we were on between the outside of PaP and Cap were actually all pretty well maintained, though traffic patterns are very interesting here... I certainly will not be driving. Driving through a town on the West coast. Rice fields in the north, as seen from the window the of the bus. A lot of rice now gets imported from the USA because it is less expensive, but Haitians maintain that Haitian rice is much more delicious... I need to do a side-by-side taste test! Rice fields leading into the mountains. You can see a little bit here how intense the deforestation is : the mountains were once covered in trees but were chopped down for the rich mahogany/fire wood. Now landslides are a very real problem in many places because there are not roots holding the soil down anywhere. But then sometimes it was so green! Dèyè mon gen mon: Beyond the mountains, there are mountains. It was a stunning part of the country to drive though as we turned east from Gonaives. The mountains were really pretty. If you look very carefully, you can see a rainbow over the mountains! 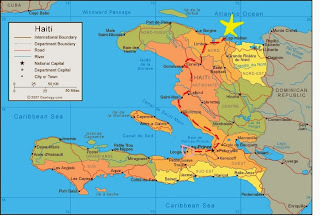 Cap is the historical center of Haiti, as it was the birthplace of the slave revolt. This is a statue memorializing the leaders. No trip north would be complete without the great pleasure of visiting with these two! Kyle Evans is my old Youth Director from Trinity and is on a three year appointment in Haiti as a special assistant to the Suffragan Bishop of the North. Dan is here for 7 months, helping to come up with a strategic plan for schools in the north. It was so wonderful to catch up with them! We spent the night at a beautiful hotel in Cap. Those are the faces of two girls that slept in air conditioning!!!!!!!!!!!!! This is a picture of more of the mountains/a little bit of the hospital at Milot. The nursing students spend two months up there at what is considered one of the best hospitals in Haiti to learn some more advanced practices and techniques that they cannot learn at Sainte-Croix. The hospital was very nice and the students enjoyed their time there! Palais San Souci: The main tourist attraction in Haiti, we only got a passing glance, but I will certainly head up there again to get a tour! Meet Kelly! Kelly is a recent University of Michigan Nursing School graduate and my roommate for the next 2 months. FSIL video conferences with University of Michigan for a community nursing class and Kelly is here to facilitate the process/learn more about nursing in Haiti/join me on my adventures! The ride back south was nothing short of an adventure: the bus was full to bursting with people and things and every time the bus would stop, peddlers of any variety of goods would come shoving at the windows, trying to sell us whatever they had, including this awesome cassava bread of the north, 12 bananas for 50 cents, and any variety of fried food you could desire. Most notably, we wound up with both a live chicken and a dead goat in a bag on the bus with 6 hours left in the drive. Glad we had air conditioning! Overall, it was a long trip but absolutely fantastic to get an overview of the country and to better be able to compare my regions to others! Taking a nod from Heidi Galligan in Tanzania, my next blog post is going to be "Frequently Asked Questions," so leave a comment or send me an e-mail if you have any questions about my first 6 weeks in Haiti! As always, thank you to everyone for your love and support.